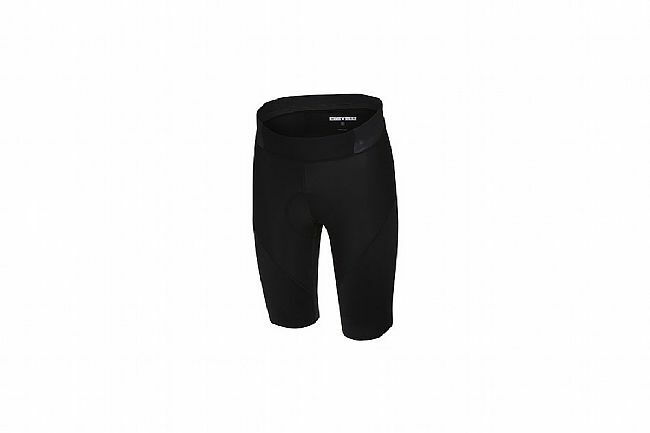 The Castelli Men's Velocissimo IV Short is made for going the distance. Featuring a new anatomical design and fit that's focused on comfort, Castelli moved the seams away from high-stress areas to reduce chafing and other comfort-affecting issues. Bringing technology straight down from their Premio short, the raw-cut leg ending does away with the traditional elastic band with vertical silicone grippers, working together with the Doppio waistband to keep the short in placed without friction. Inside, Castelli's KISS Air seat pad provides all-day comfort for the Team Sky riders, so it's than proven itself. Redesigned with an exceptional fit thats anatomically constructed for optimal comfort and support. Pro Dry Soft fabric is exceptionally moisture wicking, stretchy, and supportive. New Doppio waistband for extra stretch around the stomach area. KISS air seat pad provides all-day comfort. Raw-cut leg ending with silicone vertical gripper keeps short leg in place without pressure. Flat-lock stitching throughout reduces chafing and friction. Claimed weight: 168 grams (large). 5ft11, 135 lbs, 32 waist, 35 hips. Large barely fits - that's one size up. Have to be very careful pulling them on to get the waist part past my hips (and no one would describe me as overweight ). Next time will get XL as I am not sure how long seams will hold if they are this hard to pull on each time. Once on, fit is good, longish but not as (too) long as some of the Velocissimo bib reviews are saying. I am surprised to see riders clearly larger than me saying the Large bib fits (unless it's cut very different). By the way, am a Large in Sportful and Medium in Pearl Izumi.